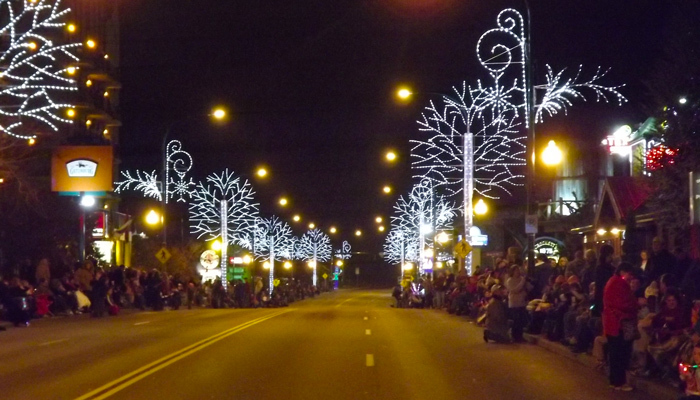 Planning on seeing the Fantasy of Lights Christmas Parade in Gatlinburg, TN in early December? You aren't alone! How Big is the Fantasy of Lights Parade? This festive parade is incredibly popular. Typically, more than 60,000 spectators attend this event with Christmas floats, marching bands, balloon characters, and Santa Claus. For over 30 years, Gatlinburg's annual Christmas parade has been the largest in the Smokies, and this year surely won't disappoint. Every year has its surprises. Each parade usually includes a celebrity guest like a musician or actor to headline the event. In 2014, the Gatlinburg Fantasy of Lights Parade even broke a world record for the most people wearing red Rudolph noses at one time. Best of all, the Fantasy of Lights Parade is the perfect time to see Gatlinburg during its Winter Magic Festival! Gatlinburg celebrates the beauty of the winter season by decorating the entire town in millions of Christmas lights and dozens of custom light displays. One of the more unique things about the Gatlinburg Christmas parade is the local businesses and theater shows that participate. Every year, major dinner theaters like the Hatfield & McCoy Dinner Show and top attractions like Ober Gatlinburg submit floats to this fun parade. As a result, this parade is a great way to see local performers! The Christmas Parade in Gatlinburg Starts at 7:30 PM on Friday, Dec. 7th or the first Friday in December. Typically, this parade with hundreds of entries lasts for over an hour. The parade route for the Gatlinburg Christmas parade is about 1.5 miles long and follows the main road through downtown. The start of the parade is at traffic light 1A on US-Hwy 321 near the end of the Roaring Fork Motor Trail. The parade route then continues past Gatlinburg's biggest attractions: Ripley's Aquarium of the Smokies and the Gatlinburg Space Needle. The finish of the parade is at traffic Light #10 near the Nantahala Outdoors Center. With thousands of spectators in a small town like Gatlinburg, the sidewalks can become very busy during this exciting Christmas event. Unfortunately, large crowds of people watching the parade can make it difficult to see all of the exciting floats and marching bands that will pass by. One of the best ways to make sure you have a good spot for viewing the parade is to arrive early. For this parade, many visitors stake out spots early complete with blankets and lawn chairs to stay comfortable during the procession. However, if you aren't able to arrive early, there are some other spots you can consider. 2. Gatlinburg's McMahan Parking Garage Near the Gatlinburg Visitor Center at 520 Parkway Gatlinburg, TN at Traffic light #3 - This 3-story garage has a great view of the parkway and is located right next to the parade route. 4. Any steps, benches, or rock walls that can help you get your head above the crowds! Here's a video of what to expect at the Gatlinburg Christmas parade, but we think that this event is even better in person! Thought the step off for the parade is at 7:30 PM, it is probably wiser to arrive much earlier. Vacationers and locals alike often arrive around 5 PM to find parking and select a good spot for watching the parade. When the sun dips, so do the temperatures. Gatlinburg is a mountain town and December is definitely a colder month in the Smokies. Be sure to bring some cold weather gear and get a warm beverage or snack to stay warm when the cool wind blows. If you arrive early enough, there are several free parking spots on River Road. However, these spots fill up quickly. There are a variety of private lots in Gatlinburg that charge a flat rate around $10. Fortunately, there are two city parking garages that offer more affordable rates. One lot is the parking garage behind Ripley's Aquarium of the Smokies and another is the McMahan garage located near traffic light #3 on the Parkway. How do 60,000 people leave Gatlinburg, a small tourist town with only 3 major exits? The streets of Gatlinburg become clogged with traffic following the parade. Parking garages and parking lots can be especially hard to get out of. With everyone trying to leave at once, it might be wise to wait out the crowds by getting a table at a restaurant. If you absolutely have to get out of downtown after the parade, we recommend taking some alternate routes to escape the worse traffic. If you're driving back to Pigeon Forge, it's probably faster to drive through the national park and go through Wears Valley. Another alternate route back to Pigeon Forge would be to take US Hwy 321 towards Glades rd. It's then possible to take back roads that connect to the Upper Middle Creed Rd area of Pigeon Forge, TN. The most crowded road is easily the Spur Road, the main route that connects Gatlinburg and Pigeon Forge. If you have to go this way, the discipline of patience will serve you well. However, if you're staying in a Gatlinburg cabin in the Chalet Village resort area, this can save you a long wait in traffic because these rentals are so close to downtown. This incredibly popular event draws big crowds every year for a reason: it's just fun. Not only will you make fun memories with your family and friends, but you'll be practically brimming with Christmas spirit after you witness this terrific holiday display. The Gatlinburg Fantasy of Lights Christmas Parade is an incredible event you won't want to miss! With these insider tips, you're bound to have a great time attending the best Christmas parade in the Smoky Mountains!